Readers, Merry Christmas to you all! I’m back in the blogging loop after several days of consuming pigs in blankets by the bucket load. 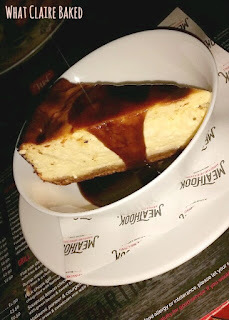 Tonight I wanted to tell you all about a trip Mr WhatClaireBaked and I went on last week – to the west end to review a newly opened American style grill called MeatHook. 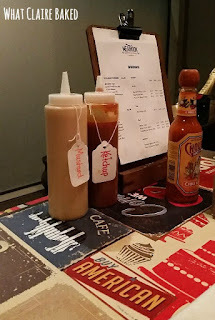 The brainchild of restaurant manager John, the dining experience includes homemade ketchups and mustards, 100% Scotch beef in all burgers, American southern-style rubs and amazing flavours from the woodchip smoker. We arrived early and the staff were quick to get us seated at a window booth. 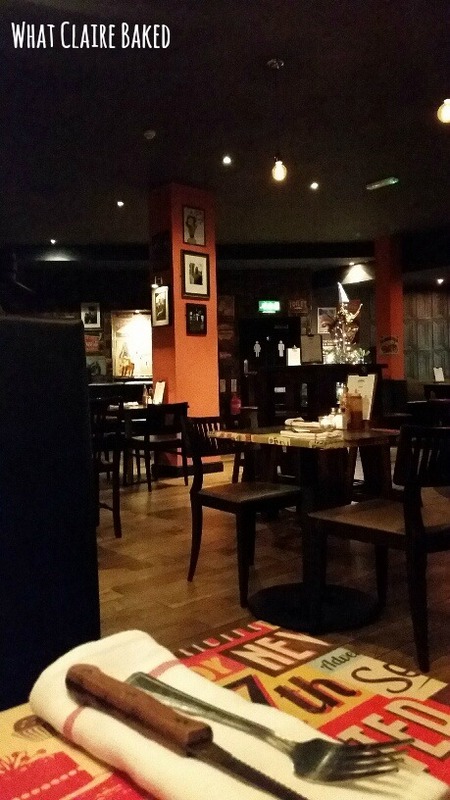 We were a bit taken aback as the restaurant was fairly quiet for a midweek close to Christmas. However, the staff explained that the restaurant had only been open 4 weeks and whilst weekends are fairly full, there’s a bit of work to be done attracting a weeknight crowd. The layout of the bar and surrounding tables provides a solution for an after-work drink, followed by food and upstairs, there’s a sizeable function area which can host around 120 people – venue hire is free and catering can be arranged for your special event. Mr WhatClaireBaked opted for one of the American beers from a selection of 5 of the menu, whilst I went for a classic Rioja, to accompany the red meat to follow. The menu highlights all vegetarian or gluten free dishes, shown by either a (v) or a (gf) – there are a number of gluten free options available and the staff will happily provide burgers without buns on salad and greens instead. Great bites, sides and fries on offer! 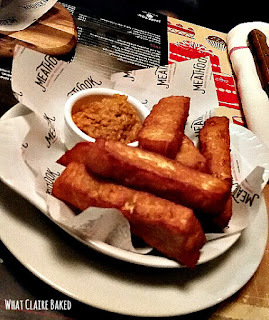 We were intrigued by the halloumi chips on offer – turns out the chef makes his own halloumi. We opted for a portion of these to share. Priced at £4.00, both of us felt the portion size was generous and a good accompaniment to our main meals. Great value for money. We decided against a starter, going straight to mains with our accompanying haloumi chips. 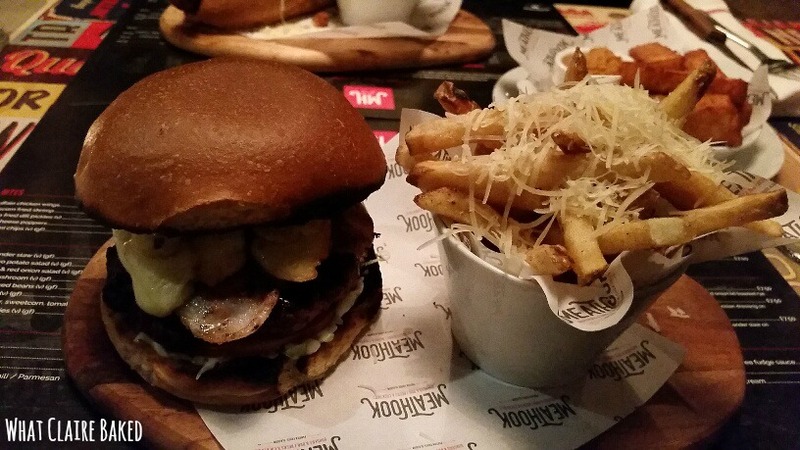 I went for a bacon and smoked mozzarella burger – the brioche bun was delicious – lightly grilled and the filling was again generous – with delicious bacon and smoked mozzarella topping the Scotch beef burger. Take note – sides are sold separately, so don’t forget to order these. I went for the parmesan topped fries. 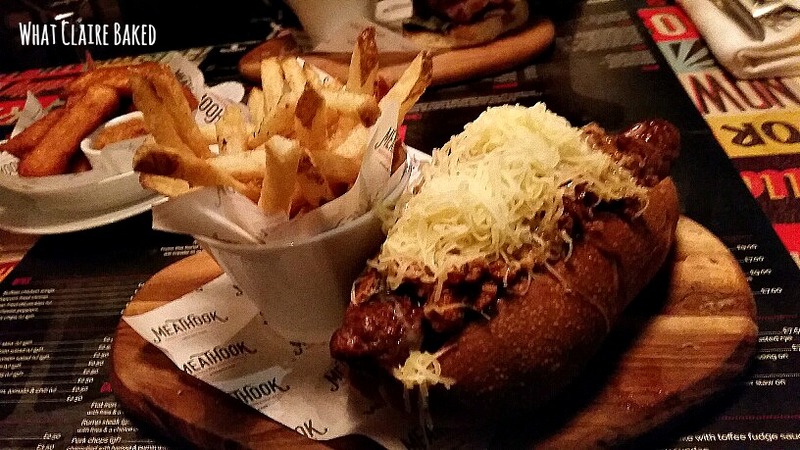 Across the table, Mr WhatClaireBaked opted for a chilli cheese dog and a side of rosemary & sea salt fries. Again, portions were generous and neither of us felt hungry at the end! 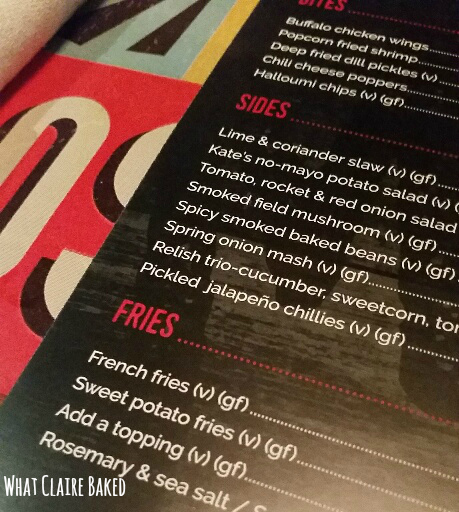 Both mains were served on wooden platters, with chips in buckets. Each main was resting on a custom print MeatHook greaseproof tissue - which added a great finishing touch. The staff were great in giving us some time between courses to relax. We weren’t sure about going for desserts, but given reassurance that there were some home-made American classics on offer, we made the commitment. I went for a classic baked vanilla cheesecake with toffee fudge sauce, whilst Mr WhatClaireBaked went for the hot chocolate fudge sundae. There was a real “all American” feel when they arrived – probably helped by the American rock playing in the background. The highlight for us was having the chance to speak to Chef Paul, who made a point of coming out to say hello at the end of the meal and checking we enjoyed the food. I know this isn’t an experience that all guests will get, however, I really appreciated the personal touch. Paul is clearly passionate about the food he creates and took the time to talk about the planned collaboration work with a Kimchi joint up the road, the use of local butchers for meat and a burger bun recipe that’s exclusive to MeatHook. He talked some more about the halloumi that he makes – honestly, the halloumi chips are a must try - and also how they make their own pastrami and slow cook their chilli with beans to add a depth of flavour. The ketchup and mustard is home-made too! Would we return? 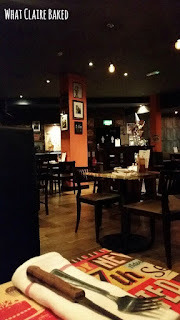 Probably – if we happened to be over West and were looking for somewhere casual to dine with a group of friends or colleagues, it would be worth a visit. It’s also a 2 minute walk from Kelvinhall subway station – great if everyone is coming from across the city. We liked the American classic tunes in the background, more than the Christmas music that was on. Because it was fairly quiet when we first arrived, the Christmas tunes were amplified – something which we both picked up on. The American songs were great – they added to the experience, rather than overpowering it. At a little over £10 for a burger/dog and a side, we felt this was reasonable for the quality of food on offer – both of us preferring to pay a little more for a locally sourced meat, rather than something from halfway round the world. Definitely one to watch in the west end – potential to become a neighbourhood favourite once word gets out there. P.S. for the ladies, there’s also a series of cocktails available for £5.50 each. I didn’t try one, but believe there’s an enthusiastic barman on hand to make them for you! MeatHook is located at 2 Partick Bridge Street, Glasgow, G11 6PL. Call 0141 339 5068 for reservations or visit their website, Facebook, Twitter, or Instagram for more information. Disclaimer: MeatHook invited us to dine at the restaurant in exchange for a review. Any opinions expressed are my own.